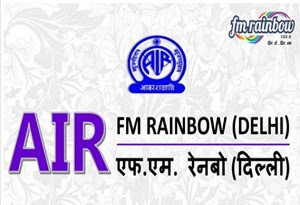 ALL India Radio AIR Rainbow FM 102.6 Live Streaming online . ALL India Radio is One of the largest broadcasting organisations in the world in terms of the number of languages of broadcast . ALL India Radio originates programming in 23 languages and 146 dialects . Rainbow FM Frequency (MHz) : Banguluru - 101.3 , Chennai - 101.4 , Coimbatore - 103.0 , Cuttack - 101.3 , Delhi - 102.6 , Jaalndhar - 102.7 , Kodaikanal - 100.5 , Kolkata - 107.0 , Lucknow - 100.7 , Mumbai - 107.1 , Panaji - 105.4 , Tiruchirapalli - 102.1 .